Thief Simulator combines elements of stealth-action titles, adventure games and simulators. The player takes on the role of a thief, and their "job" is to steal valuables from various places. 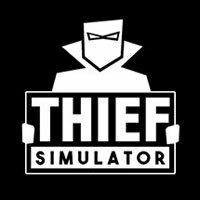 Thief Simulator for PC is an original game combining elements of stealth-action titles, simulators and adventure games. Thief Simulator was developed by GrabTheWallet Studio (an independent team) and published by Stolen Dreams. A thief who breaks into houses and steals valuables away is the protagonist. The player's role is to lead them through their "career" in such a way, that they never get caught. Thief Simulator for PC is played from the first-person view. The player robs various places; while pulling off the jobs, the player's goal is to steal as many valuable items as possible. Money obtained after selling stolen goods on the black market can be spent on specialistic gadgets, which make it easier to successfully go through further missions. Each job begins with a reconaissance phase, during which the player carefully observes the place through a camera hidden in a mailbox for instance. In such a way, not only does the player get to know about the daily routine of the inhabitants and when they are out, but also gather information concerning the alarm systems or possible ways to get a dog wandering around the backyard off its guard. When the player has finished their planning, they can jump into action. While inside, one should remember mainly that the backpack carried by the player-controlled character is not without a bottom. As a result, the player sometimes has to make difficult choices, as to which of the items they should take and what things should be left in place. The aforementioned gadgets diversify the experience – apart from lockpicks (thanks to them, one will open even the most advanced locks), the player uses a scanning device, which is capable of tracking valuable items and estimating how much they are worth. The use of this latter tool is strictly limited however, as the player can use it only a few times during one mission. The player is usually pressed for time, which makes the jobs more complicated. Moreover, even having made all the possible preparations in the name of safety, the risk of getting caught can be still high, as one cannot always predict that the owner arrives home early, or be able to find a well-hidden camera. Additionally, the more effective the player gets at thieving, the more attention they get from the police. Fortunately, the player can reduce the value shown by an indicator that tells the player how much interested in catching their character the police are. This can be done through removing various traces – it is helpful both to erase serial numbers from the stolen items or even to disassemble the stolen cars for parts. One is also capable of turning off GPS transmitters and disconnecting the stolen cellphones, tablets and computers from the Internet. All of this is complemented by an opportunity to design one's own house. For this, the player uses an in-game editor; one's place can get enriched with various security systems. The stronghold constructed in such a way can be put to a test, by leaving it to another player to rob. The three-dimensional visuals in Thief Simulator for PC are quite decent in terms of quality – one can be especially fond of the interiors of particular households, as they are filled with details. What is also worth noticing, is the game's audio – while undertaking subsequent jobs, it is helpful to listen to the surroundings; for instance, the player can hear the owner's footsteps in time thanks to such an approach. Consequently, if the owner comes back earlier than expected, staying vigilant is what can save the protagonist. Game score 9.0 / 10 calculated out of 235 players' votes. Expectations before the premiere: 8.4 / 10 calculated out of 78 players' votes.